Some of the interactive experiences at the museum included a faux diamond bath and a punching bag that reads stress levels. 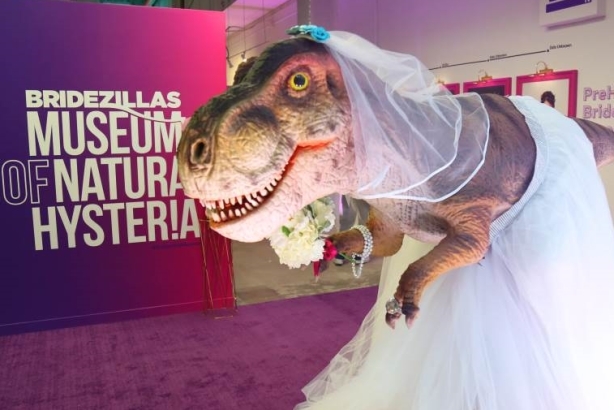 WE TV celebrated the return of its hit reality series Bridezillas, following a five-year hiatus, by opening a Museum of Natural Hysteria in the heart of Times Square. The museum was aptly named after the wedding-planning madness that ensues on the show. Planning for the campaign began in November 2017. WE TV and its creative agency for the campaign, Doner L.A., began building the idea of the museum out to stoke interest leading up to the show's March 2 premiere. The goal for the campaign was to invite people to experience the "bridezilla" archetype through imagery and exhibits, particularly in a way that would encourage social sharing. The campaign team looked to generate media attention to get a mix of tourists and locals to visit the museum. "Many of our targets were New York-based to generate attendance at the museum, however we also targeted the national press that covers unscripted TV," explained Rosie Pisani, EVP of marketing for WE TV. The brand landed a street-level retail space at 4 Times Square for the museum. On February 22, the day before the museum opened to the public, WE TV announced the activation through social posts and two media events. The first event was a morning ribbon-cutting ceremony at the museum, featuring several former contestants from ABC's The Bachelor. Desiree Hartsock and Ashley Herbet, who both have upwards of 350,000 followers on Instagram, shared posts about the event. I’m channeling Mary Poppins with the umbrella but LOVE being in NYC with these beauties to check out the @wetv Bridezilla’s Museum of Natural Histeria! Later that evening, WE TV hosted a press and VIP preview of the museum exhibits, which then moved to Arena nightclub for a party. The party drew a crowd of more than 400, including Porsha Holt and Remy Maaddi from Bridezillas and Teresa Giudice, Danielle Staub, Ramona Singer, and Kelly Bensimon from Bravo's Real Housewives. The exhibit officially opened on February 23 and ran through March 4. Some of the interactive experiences at the museum included a faux diamond bath and a punching bag that read stress levels. The brand also tied in a social contest. "Every day the museum was open, we gave away $250 Amazon gift cards," said Pisani. "The winner was randomly chosen from all those who posted a photo or video from the museum on Instagram and tagged @WETV and used the hashtag #BridezillasMuseum." WE TV’s Bridezillas Museum of Natural Hysteria attracted 10,000 visitors during its 10-day run, which was a 60/40 split between tourists and locals. The average visitor spent 15 minutes interacting with the exhibits. The advanced preview and press events generated media coverage in a slew of entertainment outlets, such as People magazine, Us Weekly, E!, Cosmopolitan, and TV Insider, as well as local coverage in AM New York and City Guide. During the course of the activation, WE TV's social media stats increased 178%, with only 5% of comments being negative.